Agricultural producers are facing the serious issue of escalating weed resistance to herbicides. The numbers of resistant weed species, locations affected, and herbicide modes of action involved are all on the rise. Feb. 11, 2010 – Agricultural producers are facing the serious issue of escalating weed resistance to herbicides. The numbers of resistant weed species, locations affected, and herbicide modes of action involved are all on the rise. Compounding the problem, some weeds have developed resistance to multiple modes of action, making their control that much more difficult, if not impossible. maximize the long-term sustainability of herbicides. 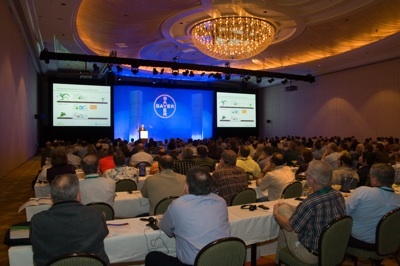 Photo courtesy of Bayer CropScience. There is an urgent need to develop and use tools and methods that will make the herbicides that are currently available more sustainable over the long term. For this reason, close to 300 participants from 18 countries met for a three-day conference in late January 2010 to discuss weed resistance issues. The meeting was hosted by Bayer CropScience and attended by representatives from industry, universities, governments, and the media. Presentations of weed resistance cases from Canada, USA, Mexico, Brazil, Argentina, and other areas drove home the fact that weed resistance is an increasing problem. Resistant weeds are present in all major crops—corn, soybeans, rice, cotton, cereals—and for virtually all classes of herbicide. Despite this, “the growers’ perception is that the resistance threat is low,” said Dr. Mike Owen, agronomist and weed extension specialist at Iowa State University. “It is not the herbicides, but the way they are used that cause problems,” stated Owen—a statement that was echoed by other industry experts during the conference. He thinks that growers have been misled by the convenience and simplicity of some herbicide systems and have disregarded the risks of neglecting herbicide and crop diversity. “Growers want to take steps, but many are unwilling to initiate programs because they don’t want to spend time planning and spend money for different, more costly herbicides,” he said. “Weed resistance is a global problem, but it is controlled locally on each farmer’s field,” emphasized Dr. Harry Strek, head of integrated weed management and resistance biology for Bayer CropScience. He noted that herbicide companies could help growers by providing better herbicide information and tailored management recommendations. Look for the FULL STORY in an upcoming issue of Top Crop Manager.